Strain the sangria into a pitcher. Peel, core and finely chop the remaining apple. Peel, section and chop the remaining orange. Mix the apple and orange in a bowl. On a small plate, blend the sugar and cinnamon. 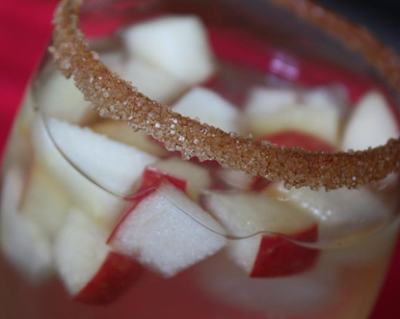 Moisten the rims of wine glasses and dip in the cinnamon sugar to coat. Fill the glasses with ice. Pour in the sangria until three-quarters full. Top with a splash of club soda. Garnish with a spoonful of the chopped apple and orange and a mint sprig. Should make around 5-6 cups of sangria. I haven't had a chance to try this yet but I am super excited to try it! If you do give it a try I'd love to hear what you thought of it.